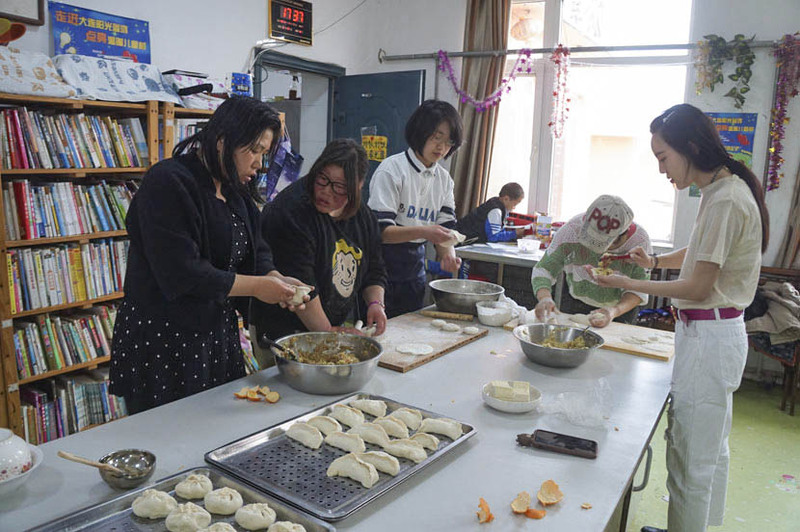 LIAONING, Northeast China — As the sun rises in the seaside city of Dalian, 46-year-old Ju Chunmei prepares breakfast for 20 children while holding 2-year-old Hai Fan. “Mama, Mama,” the little girl mumbles, pointing out a bag of oranges on the ground. In fact, Ju is not Hai Fan’s mother but a former prisoner who volunteered to look after the young charges living in Dalian Children’s Village after she was released last October. A single mother, Ju entrusted her own son to the village in 2011 when she was sentenced to five years in prison for credit card fraud. Located on the western end of the city, Dalian Children’s Village is a registered nongovernmental organization that was established in 2003 to provide a home for minors whose parents were in prison. Children of prisoners have mostly been ignored by government welfare bodies, which expects extended families to fill in when parents are incarcerated. Many of the children in Ju’s care were homeless and hungry before they came to the village, after being rejected by their relatives because of the stigma associated with having a family member in prison. Half of the children also lack household registration, or hukou, usually because they were either born out of wedlock or considered additional to family planning rules, meaning they cannot easily access many public education and health care services. Besides material deprivations, they have endured both the loss of their most loved and trusted guardians and, often, humiliation for their parents’ crimes. Society discriminates against these children, and what we do here isn’t supported by the government either. Children of prisoners are also at a higher risk of dropping out of school or breaking the law themselves, a 2006 report from the Ministry of Justice warned. The report found that there were more than 600,000 children belonging to China’s 1.56 million prisoners at the end of 2005, and nearly 95 percent of these children hadn’t received any kind of social aid. Yet no government department is held responsible for the welfare of prisoners’ offspring. The children cannot be legally adopted either, as the State Council — China’s cabinet — explicitly excluded juveniles whose parents are in prison from its definition of orphans in a notice issued in 2010. Though Dalian Children’s Village receives some donations from individuals, universities, and other charities, funding for most of its daily operating costs comes out of the pocket of its current head, Wang Gangyi. The 61-year-old took over the village in 2007, after its founder died unexpectedly and its second head quit due to the pressure of the position. “Society discriminates against these children, and what we do here isn’t supported by the government either,” Wang tells Sixth Tone. Dalian Children’s Village is now in its third home, spread over 4,000 square meters of land that Wang purchased for over 3 million yuan ($435,000) in 2012. Its 20 juvenile residents range in age from a few months to 17 years old. Wang says that the village is one of nine registered charities around the country that have served about 3,000 children of prisoners to date. Zhang Hongwei, a law professor at Jinan University in the southern province of Guangdong, has been researching the issues facing children of prisoners for several years. He tells Sixth Tone that his research suggests very few children have both parents in prison. “When we don’t have detailed data, and the number of victims doesn’t seem very large, it’s hard to push the government to enact a law,” Zhang says. Wang also has a legal background. Until his retirement last year, he worked as a lawyer and as a law professor at Dalian University of Technology. Yet he came into his role in the charity through his career as a cold-water swimmer. Dubbed “China’s Iceman,” Wang is considered a national hero for his feats in icy waters. Between 2001 and 2006, he set several Guinness World Records for cold-water swimming, including a plunge into the Antarctic Ocean. As a celebrity, he made countless public speeches; one at Dalian Nanguanlin Prison in 2004 changed the course of his life. After Wang gave a motivational speech to the prisoners, one inmate pleaded for Wang to find his daughter, who had been abandoned by his wife after he went to jail. When Wang located her, the 4-year-old had been living under a bridge for over a year, begging and scrounging for food in trash cans. “She looked so bony and frightening,” Wang recalls. Wang gradually became involved with Dalian Children’s Village after sending the girl there in 2004. When he took over the village in 2007, he gave her the name Hai Ou. Wang renames all the children who join the village, giving them the surname Hai, meaning “sea” in Chinese. For one, Dalian is the largest port in northern China, and secondly, Wang wants the kids to grow up broad-minded, with lives as vast and varied as the ocean. Now, even Ju calls her own son by his new name. “With the same surname, we are like a family,” says 8-year-old Hai Xi, who came to the village last November. Her mother was sentenced to 10 years in prison for kidnapping and trafficking, and her father died in a car accident shortly afterward. As grateful as she is to Wang, who saved her from being homeless, Hai Xi is glum and shows no interest in playing with the other children. “I miss my mom to death,” she says. She counts down the days until she can visit her mother in Shenyang, around 400 kilometers north of Dalian. “Each day seems like a year,” she mutters. It’s not easy for ex-cons to start a new life immediately after we get released. 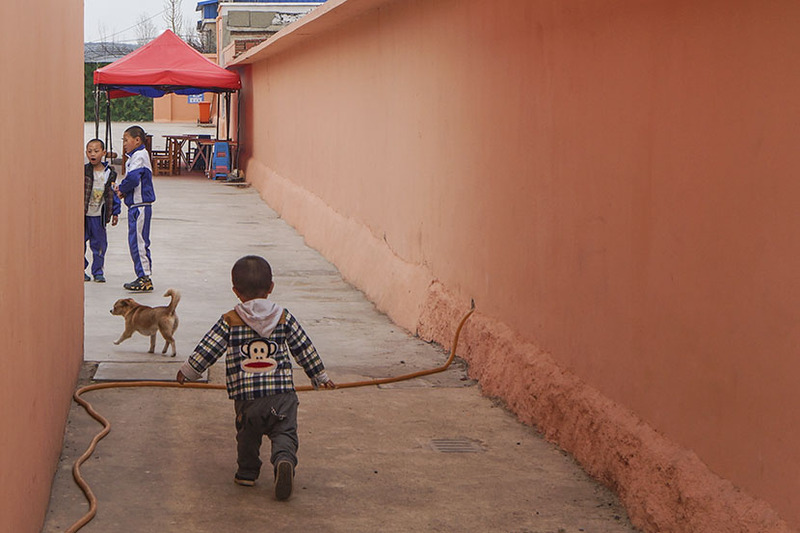 Children come to the village from all over China, so many of their parents are serving sentences far from Dalian. The cost and distance makes visits difficult, but Wang drives the children thousands of miles every year during the summer holidays to spend time with their parents. “Seeing their kids doing well gives prisoners more courage to live and remold themselves,” says Wang. Even those sentenced to death or with no hope of release find motivation in their children. The village also aims to provide a safe haven for recently released prisoners like Ju. “It’s not easy for ex-cons to start a new life immediately after we get released,” Ju says. Feeling disconnected from the wider society and facing pervasive discrimination, Ju says she feels comfortable in the village because everyone there understands her circumstances. Wang believes it’s far from sufficient to simply meet the children’s material needs. He hopes to instill self-esteem, self-reliance, and a strong sense of initiative in each of them. After school, the kids are assigned housework or gardening chores in the village’s vegetable patch. “The kids in the village are more thoughtful and hardworking compared with children who are spoiled by their parents and grandparents at home,” says Ju. But their difficult experiences also lead the village children to act out. Psychological intervention is crucial but most charity NGOs can’t afford professional staff to help these children with regard to their mental health. 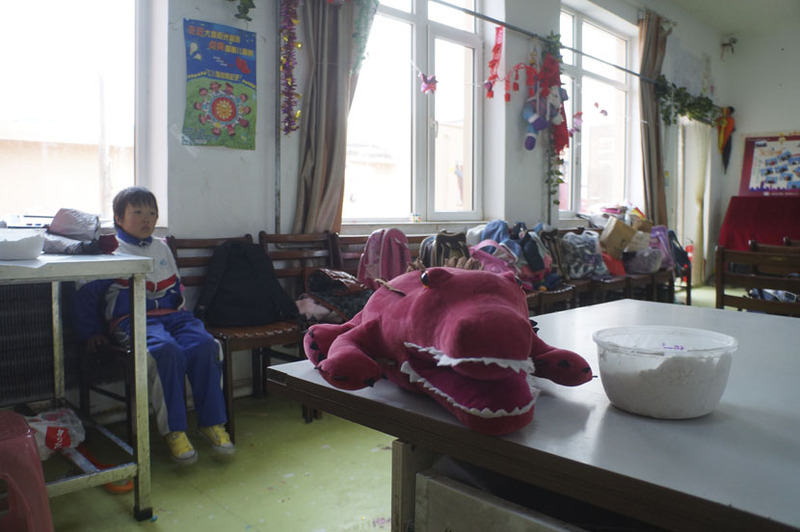 Though he believes organizations like Dalian Children’s Village benefit their charges, Zhang feels they do not address the underlying problem of legal custody and guardianship. In recent years, the Ministry of Civil Affairs has begun to take responsibility, establishing rescue centers in some cities for children of prisoners. “But it will take a long time to build support facilities and improve staff capacity nationwide,” Zhang says. More than 100 children have grown up in Dalian Children’s Village since its inception. Some stay for a couple of years until their parents are released, while others remain until they come of age. However, most of the children never return once they leave the village. Wang says many are desperate to escape the label of being a prisoner’s child at the first chance they get. He doesn’t resent their decision. “As long as they are doing well, my job is done,” he says.